I have an odd confession to make. I do not own even one single vase. I use my water glasses, jars, bottles or whatever comes in handy to host all those beautiful buds I occasionally bring at home. Soda bottles can be an excellent vessel for beautiful bouquets provided they get a little remodeling. Like, braiding or weaving a thick rope around them. I love the result of this tutorial; nautical and fresh, just perfect for the upcoming spring days! You can see the tutorial at Style Me Pretty. P.s. I'm thinking of buying this vase. Or, maybe this one. Which one do you like the most? 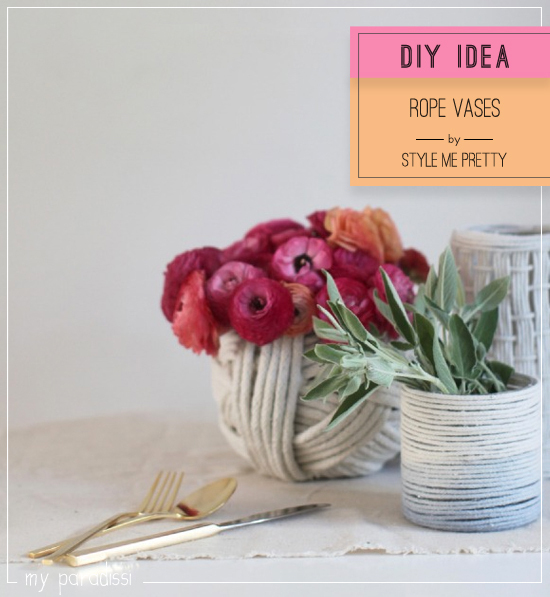 7 comments on "DIY: Rope vases"
They look very pretty...have a lovely weekend! Oh gosh you can have some of mine, haha, I have like 20!!! I love these! What a fabulous idea! I’m kind of crazy about keeping fresh flowers in the house and I’ve just been using a regular mason jar, but this is so cute! I will have to try it!